Always depress the clutch pedal all the way down. This prevents uneven wear on the clutch. 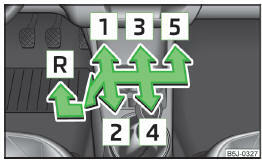 The gearshift indicator must be observed when changing gear » page 28. Only engage reverse gear when the vehicle is stationary. Depress the clutch pedal and hold it fully depressed. Wait a moment before reverse gear is engaged to avoid any shift noises. The reversing lights will come on once reverse gear is engaged, provided the ignition is on. Never engage reverse gear when driving – there is the risk of an accident. If not in the process of changing gear, do not leave your hand on the gearshift lever while driving. The pressure from the hand can cause the gearshift mechanism to wear excessively. The operation of the pedals must not be hindered under any circumstances! In the driver's footwell, only a footmat, which is attached to the two corresponding attachment points, may be used. Only use factory-supplied footmats or footmats from the range of ŠKODAOriginal Accessories, which are fitted to two attachment points. No objects are allowed in the driver's footwell – there is a risk of obstructing or restriction pedal operation.